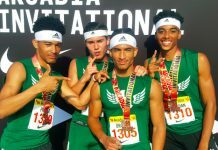 The power shift in boys track went from Helix High, which set a CIF San Diego Section meet record score of 110 points at the 2003 championships, to Steele Canyon, which captured the most recent section crowns (2008-09) by Grossmont Conference schools. 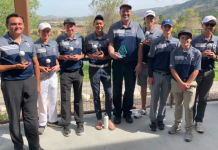 Last week, the Cougars continued their recent mastery by claiming another Grossmont Hills League meet title, making them a contender to this Saturday’s CIF meet. But the Highlanders appear to be catching up quickly, especially with a strong finish to cap the GHL championships. Fueled by strong legs by seniors Erroll “E.J.” Johnson and Shelby Hernandez, the Scotties roared past Steele Canyon down the final home strecth to claim the 1,600 relay, the final running event of the competition. The relay is often considered the way to puncuate a team title, but Helix denied Steele Canyon its moment of glory. 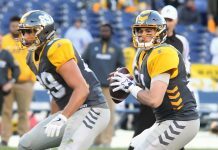 Johnson made up nearly all of a 20-meter deficit on the third leg before handing off to Hernandez, who stayed tight on Steele Canyon through two turns before sliding to the outside to pass with 50 meters remaining. Hernandez, a former Scotties football player, made the fall sports transition to cross country to stay in shape. The result was an individial victory at 800 meters in 1:54.89, winning by more than three full seconds. The top sprinter was Valhalla’s Nehemiah Brown, doubling with wins inthe 100 (10.86) and 200 meters (22.16). Steele Canyon took the other running events with wins by Brandon Howard (400), Josh Paradise (1,600), abd Tyler Lee (3,200). Howard also took the 300 hurdles, while teammate Xavier Goodlos took the 110 hurdles. Howard also took a third first-place medal, anchoring the 400 relay unit. In six field events saw champions from six different schools. Included were Bryce Eulitt of Steele Canyon (high jump); Austin Ash, Valhalla (pole vault); Kyle Norris, Granite Hills (long jump); Lonnie Tuff, Steele Canyon (triple jump); Jalen Wyatt, Helix (shot put); and Brenden Song, West Hills (discus). Steele Canyon also dominated to take the girls team title with 144.6 points over Helix (88). Valhalla sophomore Bree Harmel took the 100 meters, while West Hills’ Melissa Mongiobi, another soph, took the 200 and 400. Kristin Semancsin of Valhalla won the 800, Elaine Riveiro of Helix took the 1,600, whule Valhalla’s Andrea Hughes claimed the 1,600. Steele Canyon specialist Monique Van capped a brilliant career with title in both hurdles events, although her 300 IH victory came by just .01 seconds over Karissa Cuhna of West Hills.The Wolf Pack bounced back to take both relays. Van finished with four golds, also registering wins in the long jump (17-1) and triple jump (36-1.5). 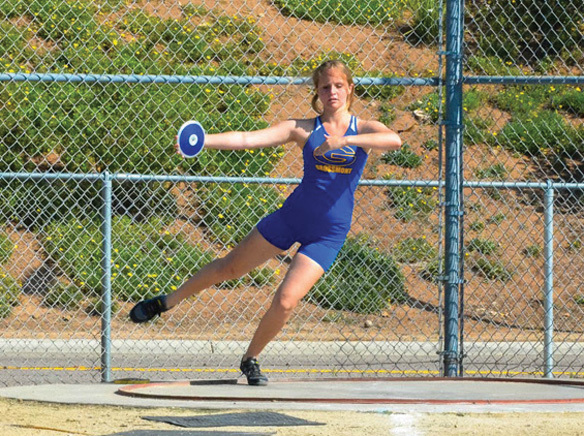 Other field event champions were: Arielle Bowes of West Hills (high jump); Valhalla freshman Jordyn Fox (pole vault); and a double in the throwing events by Sabrina Dozier, Steele Canyon (shot put, discus).